I have signed up for this plan the other day and received the HG659b Business Gateway modem, so I plugged it in and did a Spark speed test and got 206/21 Mbps, cool but my CISCO 860VAE-W router on my old fibre 100/50 plan gave me a speed test of 95/45 Mbps, so I connected it back up to the ONT and it reported a speed test of 116/19 so how can you push 200MB through a Gigabyte WAN port that only has a maximum throughput of 125MB with overhead? I have gone to many sites and have downloaded content and the max I am getting is at the high end of 12MB speeds, so WTF is Chorus playing at? prior to upgrade the plan on 95/45 my maximum speeds were around 8MB at it's highest!! Now I understand why Vodafone offers 130MB plans. go figure! What.. I don't understand your question. I suspect you are mixing Megabit and Megabyte up quite terribly. 200Mbps ~ 25MBps, so at 116Mbps, that's about 14.5MBps maximum. Yes, sorry, you know where I'm coming from!! clayton: Yes, sorry, you know where I'm coming from!! Honestly don't. Your post makes no sense. Everything you need to know is in Inphinity's answer. You seem to be confusing information about megabits (Mb) with info about megabytes (MB). A gigabit port means it is 1024megabits and 206megabits per second (206 Mbps, the speed you stated you were getting) will go through that quite easily. Ok guys, I'll repost it so sounds actuate!! It's not Chorus' or your ISPs fault that your router can only NAT 120 Mbps and not the full 200 Mbps plan speed. Just because a router has Gigabit Ethernet switch ports doesn't mean it can pass TCP/IP at that rate. Looking at the specs for the CISCO 860VAE-W, it has a Gigabit WAN port but only 100Mbit LAN ports so a single port will never be getting the full speed of your internet connection through only one port. The HG659b has Gigabit LAN ports so it gets the full 200. So, your problem is not wanting to use the equipment provided at a guess. I see your speed test image showing the maximum speed of a gigabyte port 125, guess you not on a 200MB fibre plan? Was from the Cisco site, but I guess I was looking at the wrong column :) Possibly the router needs some tweaking to the settings. Or you could just use the HG659b. That's my point, I'm running a HG659b Business Gateway but it only NAT 120Mbps. Where has my other 80Mbps gone? for a 200Mbps plan it is maxing out at 120Mbps hence the maximum a Gigabyte port can throughput of 125Mbps, would like to know if anyone else are getting higher speeds on this plan? clayton: That's my point, I'm running a HG659b Business Gateway but it only NAT 120Mbps. 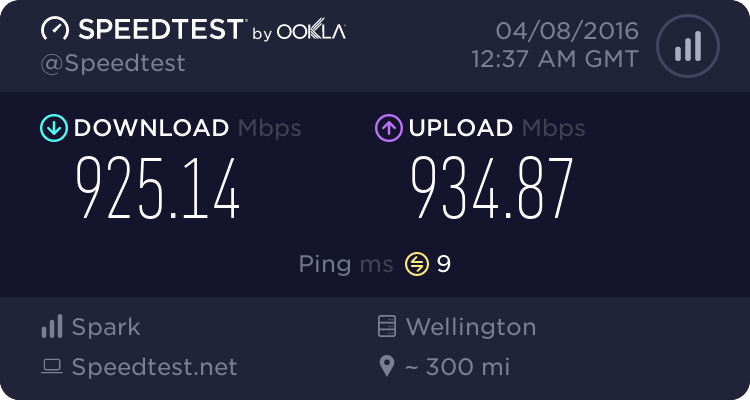 Where has my other 80Mbps gone? for a 200Mbps plan it is maxing out at 120Mbps hence the maximum a Gigabyte port can throughput of 125Mbps, would like to know if anyone else are getting higher speeds on this plan? The HG659b can easily NAT 200mbit as I have tried this myself on my own connection. Again you're making absolutely no sense in your posts. Your Huawei does 200Mbps (as you've indicated by your speedtest) but your Cisco doesn't. Lots of Cisco kit in that range has terrible WAN to LAN routing performance, despite having Gigabit ports. Your 860 VAE-W also only has 100Mbps LAN ports so isn't capable of getting more than 93Mbps via a LAN connection. I can only agree with what has been said above. Your Spark supplied Huawei works to spec. Your Cisco does not. You need to upgrade your Cisco to a higher grade box if you want to use the full 200mb connection. This has nothing to do with Spark.. but a limitation of the router you are using. The Cisco 860 will max out thruput (running NAT) at about the speed you are getting. It is no good for your 200Mb/s Plan. It is ok (just) for the 100/50 Plans.